This is a great Case Study from Buffer about a Digital Marketing start-up in the UK and how they have been using Social Media. This start-up has been using social media to push the revenue for their customers with 90% of customers staying on board with the agency. The Case Study provides insight in to their approach to not only approaching their clients but on how they approach the social media platforms as marketing channels. Recently, we had interviewed Mediafy which is apart of Bonnier about their Sales Process and experience with using Otto. They were able to describe how they used marketing automation and email marketing to help within their sales process. Click the link to view the video and see what they have to say. I am a firm believer in life-long learning and here’s a method to make sure you can do that. It’s becoming more and more difficult to ensure we have time for ourselves, let alone time for us to achieve our goals. Read how Benjamin Franklin and Bill Gates are able to organise their time to ensure they can continue to learn. 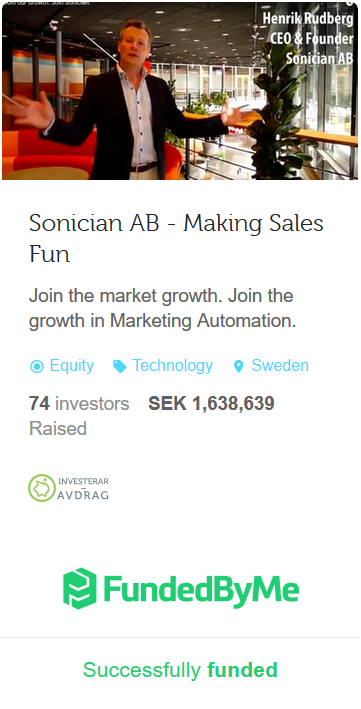 Weekly Prospector – The Strategic Marketer is given out to companies from Sonician AB, the Marketing Automation specialists in Göteborg and Stockholm and the creator of the leading Marketing Automation solution Otto® with Bulk-CRM and Autopilot capabilities.